Missing Vowels Quiz is very good English Word Brain Teasers. Earlier we have published Missing Vowels Quiz with Fruits names and Fill in the blanks with vowels with animal names. These brain teasers are very much liked by kids and teens. Here are some more theme based fill in the missing vowels brain teasers in which one has to guess the shapes names by adding the vowel names in the blank spaces. In these Missing Vowels Brain Teasers names of the Geometrical Shapes are given. However from each of these shapes names vowels are removed with blanks. 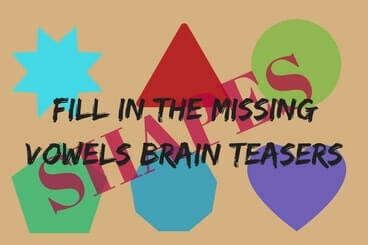 Your challenge is to fill in the blanks with vowels to get the shape name. Answers of these Fill in the blanks brain teasers are given at the end. Lets see how many of these brain teasers you can solve without looking at the answers? Don't forget to checkout following Brain Teasers which will given challenge to your mind. 1. Easy Rebus Puzzles for Kids: These are introductory rebus puzzles. These are very easy puzzles and can be solve very quickly. 2. Fun Brain Teasers: This contains mixed brain teaser with answers. Brain Teasers in this post are Mathematical, Logical and also many English Word Brain Teasers. 3. Fun Word Brain Teasers with Answers: It contains many different English Words Brain Teasers to test your English Knowledge.